Can an injury in a sports contest constitute a battery? Most injuries in sports contests—even if caused by direct contact from an opposed player—would not constitute a battery. The theory is that a sport participant consents to performing in sporting events and, therefore, assumes the risk of injury when playing. However, if a participant intentionally engages in egregious conduct that flouts the rules of the sport, then he or she can be liable for battery. For example, a federal district court refused to dismiss a lawsuit by former Denver Broncos defensive back Dale Hackbart, who was struck with a forearm to the head by Cincinnati Bengals running back Charles Clark, while Hackbart was kneeling on the ground. 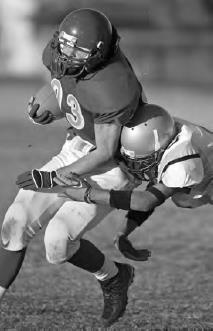 When playing contact sports, it is expected that injuries will occur. However, egregiously violent behavior may be grounds for charges of assault and battery (iStock).